BMW 3 Series: driven | What Car? In business, standing still is moving backwards, so they say. Theres no danger of BMW taking its supremacy in the compact executive market for granted, though, hence the latest range of updates. Most noticeable are cosmetic tweaks to the Coupe and Convertible models, which have new bumpers, lights, bonnet, sill panels and wheel designs for a sharper look. There are larger door mirrors for improved visibility, too. All 3 Series models have new steering wheel designs and new entertainment systems, while all Coup and Convertible versions have Dakota Leather as standard. The entire range has subtly tweaked suspension, in the guise of new damper valves to improve ride comfort, but the most notable mechanical change is the updated range of engines. Theres a reworked 2.0-litre diesel engine for the 320d, with power up from 174- to 181bhp and torque boosted by 22lb ft to 280lb ft. Fuel economy has improved by 1.2mpg, however, while CO2 emissions drop by 3g/km. There are similar changes to the lower-powered 318d version, while the six-cylinder 325ds engine also has more power, but lower emissions. At the top end, the 335is 3.0-litre petrol engine is just as powerful as before, but the switch to a different turbocharger has boosted fuel economy by 2.6mpg and dropped CO2 emissions by 22g/km. When it comes to efficiency, nothing beats the new 320d Efficient Dynamics Saloon. Lowered suspension, special wheels and tyres and longer gearing help to drop CO2 emissions to just 109g/km and theres a sophisticated flywheel that cuts down on vibration at low revs to help you drive as economically as possible. Its available as a saloon, in SE trim, and BMW expects it to be a big seller. We can see why, because its smooth and frugal as the hype suggests. 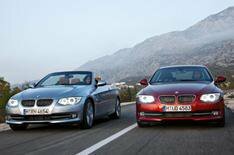 We tested both versions of the 320d and the 335i in Coupe and Convertible form. Were not convinced that the new 335i engine is any better than the one it replaces and it was hard to discern any great difference in ride quality on the German roads we drove on. The improvements in efficiency make the 3 Series more appealing than ever, however, and it remains unsurpassed for driver appeal, refinement and interior quality. The best just got better. Updated 3 Series is better than ever.